Le yokozuna Hakuho a sorti sans difficulté le komusubi Mitakeumi et reste l’un des trois lutteurs toujours invaincus du tournoi. 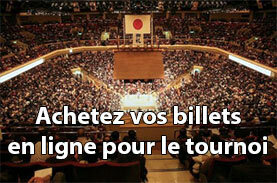 Kisenosato a puisé dans ses ressources et a vacillé plusieurs fois face à Chiyoshoma mais le yokozuna s’est finalement imposé. Kisenosato (3-2) a lutté pour battre Chiyoshoma qui avait trouvé de bons appuis et tenté à deux reprises de déstabiliser le champion. Le trio de leaders est resté inchangé avec les yokozuna mongols Hakuho et Harumafuji ainsi que le sekiwake Takayasu. Hakuho a totalement dominé le komusubi Mitakeumi (3-2) en le tirant peu après la charge pour l’envoyer à terre. Harumafuji n’a pas eu le temps de transpirer, le yokozuna s’est précipité directement sur Daieisho (0-5) pour trouver une prise dans son dos avant de le sortir de l’anneau. 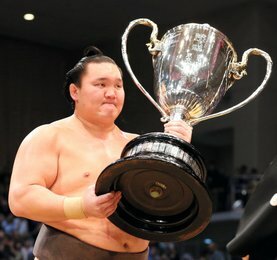 Le yokozuna Kakuryu s’est retiré du tournoi en raison d’une blessure à la cheville gauche. Le mongol, qui termine avec un score de 1-4, a donné la victoire par forfait à Okinoumi. Takayasu fait chaque jour un pas de plus vers une promotion au rang d’ôzeki. En absorbant la charge de Endo (2-3), le sekiwake s’est imposé. Avec un parcours sans faute jusqu’alors, Takakaysu est déjà à mi-chemin de la promotion mais doit encore remporter cinq combats sur les dix jours restant. L’ôzeki kadoban Goeido a obtenu sa troisième victoire en battant le maegashira 1 Chiyonokuni (1-4). L’ôzeki Terunofuji (3-2) a également gagné son match en survivant aux puissants assauts du sekiwake Kotoshogiku (1-4). Yokozuna Kisenosato dug in deep to get his faltering bid for a third straight championship title back on track with a win over second-ranked maegashira Chiyoshoma at the Summer Grand Sumo Tournament on Thursday. Looking to rebound from a shock second defeat Wednesday, Kisenosato (3-2) had his hands full as Chiyoshoma got himself into a good position and twice attempted to take the grand champion out with backward leg trips at Ryogoku Kokugikan. But Kisenosato, who is recovering from left upper arm and chest injuries sustained at the Spring tourney in March, got a second wind and bundled Chiyoshoma (1-4) out to remain two wins off the pace at the 15-day meet. The top three remained unchanged, with Mongolian grand champions Hakuho and Harumafuji sharing the lead at 5-0 with sekiwake Takayasu. Hakuho oozed class in his bout against Mitakeumi (3-2), drawing the komusubi in after the charge and sending him to the dirt with a routine uwatenage overarm throw. Hakuho missed most of the Spring meet due to toe and thigh injuries but looks in good shape here as he seeks to extend his all-time record of championship titles to 38. 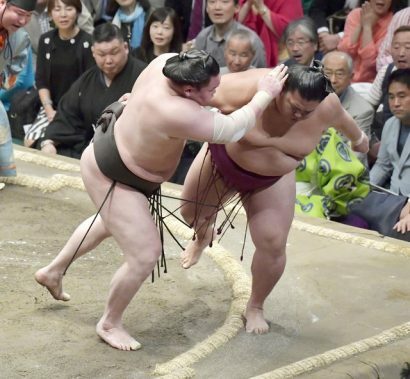 Harumafuji barely broke sweat in his first meeting with third-ranked maegashira Daieisho (0-5), scoring a quick-fire pulling overarm throw win to preserve his unbeaten start. Kakuryu, the other grand champion in the elite makuuchi division, pulled out of the tournament earlier in the day due to a left ankle injury. 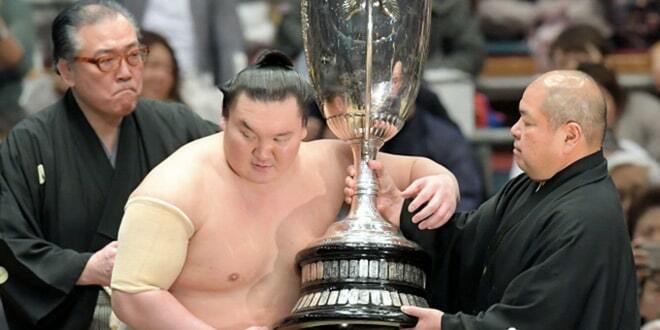 Kakuryu on Wednesday was shoved out of the raised ring by komusubi Yoshikaze for his third defeat in four days. He lost Thursday’s scheduled bout against second-ranked maegashira Okinoumi, leaving both men back with 1-4 records. 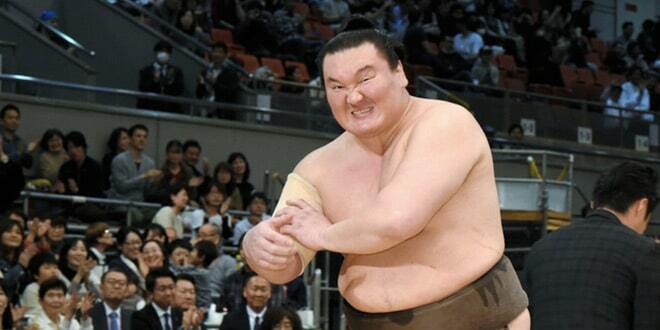 Takayasu further boosted his chances of a shot at promotion to ozeki, soaking up Endo’s (2-3) charge and marching the top-ranked maegashira out of the ring. Takayasu won a combined 23 bouts over the last two tournaments and is halfway toward the 10 victories he needs at this meet to be considered for promotion to sumo’s second-highest rank. Elsewhere, Goeido scored the third of eight wins required to retain his ozeki rank, fending off a lunge to the throat and seeing off No. 1 maegashira Chiyonokuni (1-4). Goeido came into the tournament with his rank on the line after he pulled out of the Spring meet with an ankle injury. Ozeki Terunofuji (3-2) also won, the Mongolian finishing off sekiwake Kotoshogiku (1-4) with a perfectly executed uwatenage overarm throw.